I don’t know about you guys but I struggled to keep Reya active during the winter. While she loves her “walkie”, it’s a bit too cold to go on long walks. For this reason I try finding a variety of cute toys that keep Reya happy and active throughout the winter. Lately, I have been trying to find something that encourages her to use her muscles and that she can play with in our apartment or in our basement at home. Lately, I found the perfect toy that is ideal for pet parents like me, and can be played indoors or out – the Tuggo! Looking for an awesome dog toy for your favorite dog? If so, we think you will love Tuggo! This one of a kind dog toy uses weight to provide tension for dogs, so that they can play tug-of-war themselves or just have fun! The toy itself is a hard, hallow plastic ball with a rope that goes through the middle that can be pulled from either side to create a tug of war effect for your dog. To add the weight, just take out the recessed screw, fill with water, and your dog will have fun listening to the slashing sound as they pull this toy around themselves or with a friend! Best of all, it is awesome exercise since the toy, when completely filled, is approximately 20 lbs! With this adorable toy, dog can easily have fun for hours! To see dogs of various sizes play with Tuggo, feel free to watch the video below! So far, this toy is a major hit in our household. At first, Reya was very nervous about the toy since she had never had such a large toy with water inside. After mom and dad started playing with the toy though, she had to get in on the action and play with it herself. Now, she drags this toy around the house if she can only play indoors or tries bringing it down the stairs with her (unfilled with water) if she wants to go outside. I have a feeling this toy is going to be even more fun in the summer. 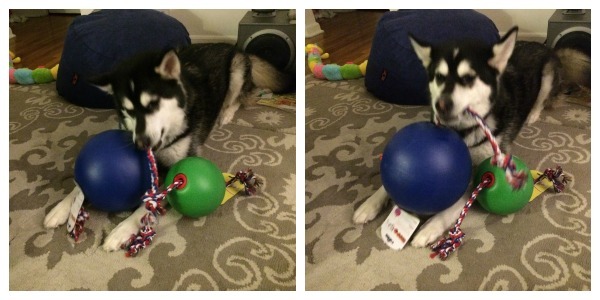 Personally, I think Tuggo is an ingenious toy and perfect for any dog parents. Based on my own experience, I am happy to give Tuggo an A rating! Want to purchase this awesome toy for a special dog in your life? Head over to the Tuggo website where you can purchase this water weighted toy for your favorite pup for $27.99 – $29.99. Want to learn more? Check out Tuggo on Social Media! These look like really nice dog toys but my silly dog doesn’t like to play with toys for some reason. Not sure why? Thank you for your review. Very welcome! My mom’s yorkie is the same way. She has only played with two toys her whole life – this ugly old puppet and a little chew ball. Nothing else catches her interest. I am a professional petsitter and am well aware that large dogs have trouble getting the exercise they need in the winter. What a great idea for when it’s too cold outside! what dog doesn’t love to play tug o war!!! I know my little pup Bella whch I loved sooo much (named my blog after her, meandbella.com) anyways I love to read and hear puppy stories. More please!!!!!!!!!!!!! This seems like it would be a great gift for our granddoggy Chevy! She is a pitbull/bulldog mix and is a tough cookie. I love trying to find sturdy but also very fun and unique toys to send and spoil her with! I like that this is so different from many dog toys I’ve seen and that it has a weighted factor and water sounds factor that makes it really stand out as special. This is one of the big reasons I love reading blog reviews, so I can learn about cool things I probably would not have ever known about otherwise! Thanks! My dog Ranger prefers stuffed animals, however I dog sit quite a lot and know that my part time kids would love this! I love my dogs (including foster dogs) but they go through stuff animal toys in a matter of seconds but this toy looks sturdy and long lasting! Our St.Bernard Snowplow lives to play tug of war and this would be a great toy for him. He’s part of the Ski Patrol on a search and rescue team so these type of activities are great and add to his skill level in search and rescue. Rene, that is so cool! Work dogs are the best! MY 4 DOGS LOVE THEIR TOYS. THE TWO 2 YR OLDS LOVE TO PLAY TUG-O-WAR WITH EACH OTHER. I KNOW THEY WOULD ALL LOVE TO WIN THIS NEW TOY. This looks like a great toy. I really like that you can put water in it. My dogs would love that!